Do your nail shape really matter? What shapes do you like your nails? This is always a manicurist’s question when you want to get your nails done. If you think about it, you would realize your answer have always been spontaneous because you almost never give it a thought. This could be as a result of not wanting to be stuck with a shape you don’t like due to constant changing. Or it could be you feel your current nail shape best describes you. Both outcomes are completely true but let us consider the second reason. Your nail shape does not reflect your personal style; it also tells people who you really are. Sharp Stiletto Nails: This best describes the rebellious (fashion wise). This is the kind of nail shape for women who don’t mind looking or being different, being trendsetters and are completely aware of what’s going on. Can Certain Foods Improve The Way You Look? Indeed you know that maintaining a healthy diet is good for you in a variety of ways; it can improve your sleep routines, boost your energy levels and greatly reduces your chances of falling ill. But did you know certain foods can enhance your physical appearance? 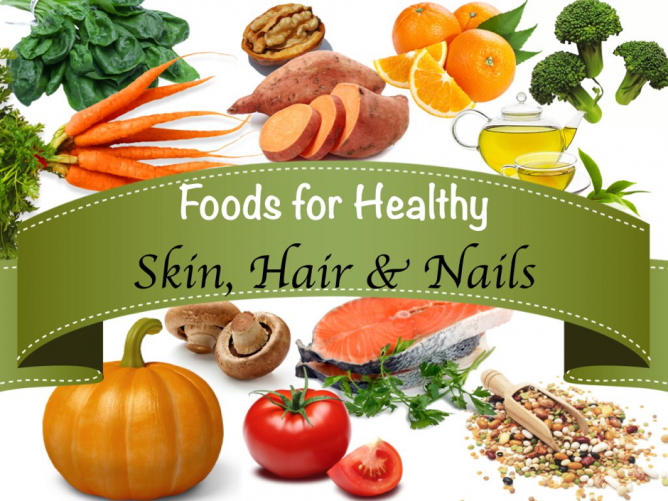 In this article, we will highlight the various classes of nutrients that can aid your nail and hair growth and also give it the extra durability and glow it deserves. Vitamin H also knows as Biotin can fix thinning or splitting hair, as well as repairing damaged nails. Vitamin H has even been used to treat hair loss, a situation known as alopecia and when taken with corticosteroid clobetasol propionate and zinc, it is super effective. DiBona Nina, a dietician at the Sports Club in the US, confirms. “A lack of in Vitamin H could result in hair loss or brittle hair.” A less stressful way to recall: The H in supplement H represents “haut and haar,” which indicates “nails and hair” in German-born, as the dietician says. Try eating salmon, peanuts, lentils, eggs, cauliflower, beans, and banana. To get more shiny hair, make omega-3 part of your diet, which improves scalp health and could also give your hair extra glow and lustre, according to Nina DiBona. The stratum corneum is the exterior part of the skin and it relies on eicosapentaenoic acid, linolenic acid and alpha which are necessary fatty acids in the body to function properly. The stratum corneum also contains keratin and this gives helps its water-holding abilities. Lack of these necessary acids can lead to dandruff or a dry scalp. Try eating walnuts, tuna, spinach, sardines, salmon, mackerel, fish oil, flaxseed and eggs. Who does biting your nails really say about you? If you are fond of biting your nails, then you need to stop whatever you’re doing and read this. Studies suggest that individuals who indulge in mindless activities like nail biting and hair twisting possibly possess certain character traits. A study was done at the University of Montreal in 2015 and it revealed that involuntarily biting your nails, pulling your hair or other related practices can uncover a person’s trait or personality. The study also revealed that people who get frustrated or bored easily or an impatient person to be a hair puller or nail-biter or twister etc. According to the study, these characteristics indicate perfectionism. A publication in the March 2015 edition of Journal of Behavior Therapy and Experimental Psychiatry suggests that the perfectionist trait could be a major cause of these lifestyles, and also that perfectionism is something that people ought to take seriously. A lead author and Professor of the University Psychiatry department, Dr. O’Çonnor Kieron said he believed people with such repetitive characters are likely perfectionist, and it means they are unable to perform tasks at a normal rate and are also unable to relax. He also said they are easily frustrated, prone to dissatisfaction and are impatient when they do not achieve their goals. They also get bored easily. How do you do gel nails at home?